A children's "hay party" is the merriest affair imaginable, and it is easy to give immense pleasure to any number of children with the smallest possible expenditure of time and trouble. The only accessories required for any number of impromptu game competitions, which can be arranged on the spot, are a number of small hay-rakes, such as the village carpenter will make for a few pence each, a basketful of well-scrubbed potatoes for potato races, half a dozen big pocket handkerchiefs for binding competitors to-" gether for three - legged races, and last, but not least, a rough garden cart and donkey. If no donkey is available, get a hand waggon, such as one often sees village c h i 1 d r e n playing with, made from an old box mounted on four wheels, with a wooden shaft in front to drag it by, painted bright red. The donkey-cart, if there is one, should be gaily decorated with flags-one at each corner-while the smartness of the turn-out is still further enhanced if the donkey himself is caparisoned with a flag over his back and wears red, white, and blue rosettes at either ear. The driver's whip may be decorated with a ribbon streamer to match. A word of warning here is necessary, however. It is dangerous to drive any sort of cart over hay - covered ground where children are, or have been, playing, for fear of accidentally driving over any of the small folk who may still be hiding in it, or who have even, perchance, made a sweet-scented nest, and fallen asleep there. If a donkey-cart is not available to transport the necessary impedimenta to the field, a small hand waggon, painted some gay colour, can be utilised hidden quite out of sight. A donkey-cart, therefore, should only be used up and down any wide green lane which has been made through the hay specially for the purpose, or where the hay has already been carted. 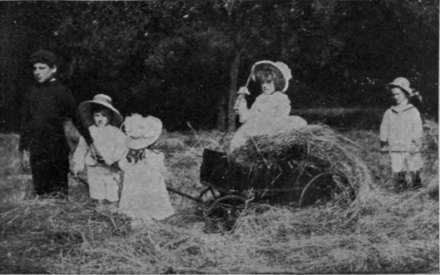 The invitations to a hay party should be sent out a week or two beforehand for whichever Saturday afternoon it is foreseen that the hay will have been cut and still be lying, the little guests being asked to arrive at half-past three. 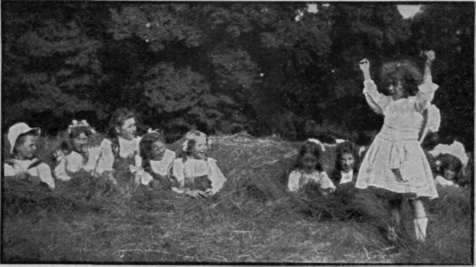 If one does not own a hayfield of one's own, a friendly farmer will often obligingly put one of his at the would-be entertainer's disposal, for a party of children not only do no harm to the hay whilst it is lying, but help to give it a thoroughly good tossing in the course of their games and gambols. 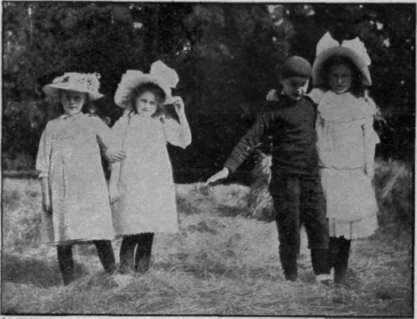 A holland smock is the ideal garment for a child at a hay party, but failing this, the plainest of white or coloured linen and cotton suits and frocks, with shady sun - hats or sun-bonnets, should be worn. Directly the little folk arrive and catch sight of the field of delicious sweet-scented hay awaiting them, they are sure to rush off in a body to romp and play in it, rolling each other in it and tossing about fragrant armfuls, or collecting it to make ammunition for a spirited hay - fight. Huge castles are speedily erected with the help of the hay-rakes with which each small guest will have been provided on arrival. These castles will be attacked and defended with spirit and unabated vigour, victors burying the vanquished underneath loads of hay, until everyone is breathless with laughter, and glad enough to obey the summons to the picnic tea, held in a shady corner of the hayfield promptly at half-past four, to allow plenty of time for games and competitions to take place afterwards in the cooler part of the afternoon. Tea for the "grown-ups," made from a kettle-stand over a spirit-lamp-in a tin biscuit-box in a safe corner-and jugfuls of milk for the children, white and brown bread-and-butter, fresh lettuces, jam, buns, and sponge cakes make delicious picnic fare spread on a white cloth, adorned with sprays of wild roses, with the addition of huge dishes of strawberries, should these chance to be ripe, as they sometimes are before the hay is carted. 5. Hidden Identity Guessing Competition. Directly after tea an umpire must be appointed, and a starter, who, armed with a notebook and pencil, must take down the list of competitors in each race and competition, and afterwards mark the winners on the spot, in order that there may be no hitch when the time arrives to award the prizes. A third "grown-up " must also be found willing to act as winning-post, armed with a big rake, which the winner in each competition must actually touch. All hands must next be mustered, armed with rakes, to clear a long straight road through the hay to serve as racecourse. The big mounds thus made on either side will serve as settings for several of the later competitions. In the hopping race the competitors are arranged in a line at one end of the racecourse, while the "winning-post," holding the upright rake, stands twenty yards away. The hidden identity guessing competition, in which the only clues afforded the puzzled entrant are the shoes or boots of the buried victims foot from starting-point to winning-post, and anyone touching the ground with the left foot is disqualified, and must fall out of the race. No easy matter this, to hop twenty yards over uneven hay-strewn ground, and of fifteen or twenty starters seldom more than six or eight " stay the course." For the three-legged race big handkerchiefs, folded long-ways, are produced, and the competitors, who choose their own partners, having entwined their arms round each other's waists, are securely tied together at the ankles. The course is the same as for the hopping race, and the competitors who fall on the way, if they have nearly reached the winning-post, wisely crawl on along the ground instead of wasting time in trying to get up again-always a lengthy business-and often a pair of crawlers win the race. For the potato race a number of big baskets are swiftly twisted up from ropes of hay, and arranged in a row at the starting-point, while the umpire, carrying a big basket of potatoes, arranges them in rows of eight or ten in long lines from each basket up to where the "winning - post" stood, her place being now taken by a line of rakes, to show competitors that here their hunt for any missing potatoes may cease. To start the race, each competitor stands beside his or her hay-basket, and at the signal "Go !" each one must run to the nearest potato in his or her own line, and picking it up, run back with it to drop it in the basket before running to retrieve the next, and so on until the whole eight or ten have been each one separately garnered in. The competitor who first succeeds in picking up all his or her potatoes and placing them one after another in his or her own basket wins the game. The hay shoe-pie is a particularly good competition, in which children of all ages delight, though, if there are many tiny tots of the party, besides big boys and girls of eight to twelve or fourteen, it is a good plan to let them compete separately, and to have two hay pies going at once. First of all, a huge mound of hay must be erected half-way down the racecourse-ten yards away from the starting point. The competitors must next take off their left shoes and sandals, and place them in a basket provided for the purpose by the umpire, who, carrying them away with him, must proceed to bury them thoroughly in the hay pie. At the signal "Go!" each competitor must hop on the shod foot to the pie, hunt for his or her shoe, and put it on properly before running on to the winning-post-ten yards on the other side of the pie. The wildest excitement prevails round the pie as competitors, having arrived there, hunt madly in the hay for their missing foot-gear, and the winner, on arrival at the winning-post, as a rule receives an ovation from the assembled onlookers. In the hidden identity guessing competition a long bank of hay, six feet wide and three or four feet high, varying in length according to the number of competitors to be concealed in it, must be erected. The guesser, having been chosen first of all, must go away and hide her eyes against a tree, while the hiders-from six to twelve of them-conceal themselves in a row in the pile of hay, leaving only their feet sticking out ! The guesser is next recalled, shown the row of boots, slippers, sandals, and shoes, and asked to guess the identity of the owner of each pair of feet. When the guesser has identified the hiders, she claps her hands as a signal for them to reveal themselves. As a rule, her guesses are wrong claps her hands as a signal for all the hiders' heads to be popped out, only to find to her chagrin, as a rule, that every guess is wrong. This game goes on for some little time, as each child takes a turn at guessing, while the former guessers hide with the rest, and when it is over it will be found high time to wind up the festivities with a tug of war, in which all but the tiny tots must join in. A strong thick rope must be provided, and it is a good plan to twist several strands of rope together and bind them with red cotton material, making a huge knot at either end. The babies of the party meantime all have been kept very busy playing together in the hay with the red waggon, with one or two other bigger children to give them rides by drawing it about the field. When the tug of war has been decided good-byes are said, and everyone repairs to the garden for home-made lemonade and cakes, while the prize-winners receive their prizes, which may vary from bats, balls, dolls, kites, or tops, to penny toys.